If you look at the record books from other states, it is obvious to me that missouri has the "midget" strain of rainbow trout. We just produced a record brown, so why not continue that success using our strain of rainbow. I think they could quite easily" trip out" the current strain and produce some 25lb rainbows in the next 10 years. Taneycomo would be the ideal proving ground. Plus look at the possibility at having a few in the trout parks. And don’t forget the winter trout programs for the city parks in urbanville. 25 pounders all winter long in them little ponds. I would love to see this. 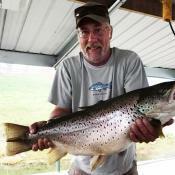 Didn't a guy catch and release a potential state record a few years ago on Taney? I think they found a dead one that would’ve broken it. One controversial rainbow turned out to be a hoax. Don't recall the details. Laker this was the article I came across. Wasn't this fish caught multiple times, too? Like I say I do not know the details as fact, but this is the fish I was referring to. A later article on fly fish taneycomo discredited this account.